TKR4301X – Complete Traktion Drive Kit (w/shoes, springs) – Tekno RC, LLC. By popular demand, the legendary Traktion Drive is back! This system gives your electric vehicle a ‘nitro feel’ and improves consistency by reducing the instant acceleration of modern electric systems. Traktion Drive employs a special clutch shoe and spring design to ‘PUSH’ the shoes into the clutch bell. So it’s engaged at zero RPM and has no lag but still provides some ‘give’ on hard acceleration or impacts. It’s extremely helpful on loose or rough tracks as the Traktion Drive will smooth the power delivery as the vehicle traverses through bumps. If you’re a nitro and electric racer, this system will make transitioning between the two vehicles easier as your electric vehicle will feel more like a nitro. Slip amount is adjusted by using different diameter springs. Use lighter springs (0.8mm, 0.9mm diameter) for better traction (more slip) on loose tracks. Use thicker springs (1.0mm, 1.1mm diameter) on higher grip tracks. 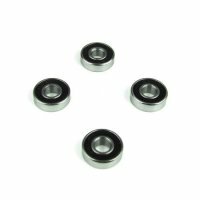 The Traktion Drive kit is compatible with our EB48 series buggies as well as most 1/8th scale electric vehicles that use a 5mm shaft. 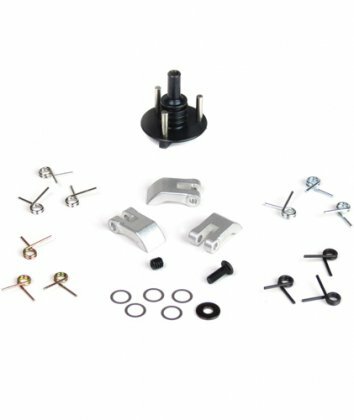 The adapter is light, made from hardened steel, spins true, and is easy to set up. 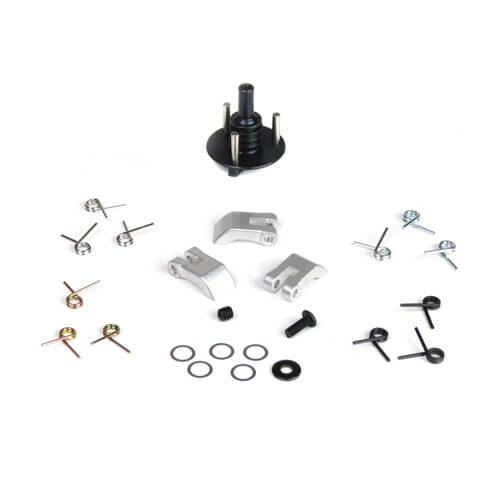 This system uses standard 3 shoe clutch bells, purchased separately. Please see the special requirements below. 1ea 1/8th 3 shoe adapter (TKR40000A), 3ea 7075 Traktion Drive clutch shoes (TKR4301), 3ea 0.8mm springs (TKR4308), 3ea 0.9mm springs (TKR4309), 3ea 1.0mm springs (TKR4310), 3ea 1.1mm springs (TKR4311), 1ea M3x8mm button head screw, 1ea M4x4mm set screw, 1ea M3 washer and 5ea 5x7x.2mm shims. 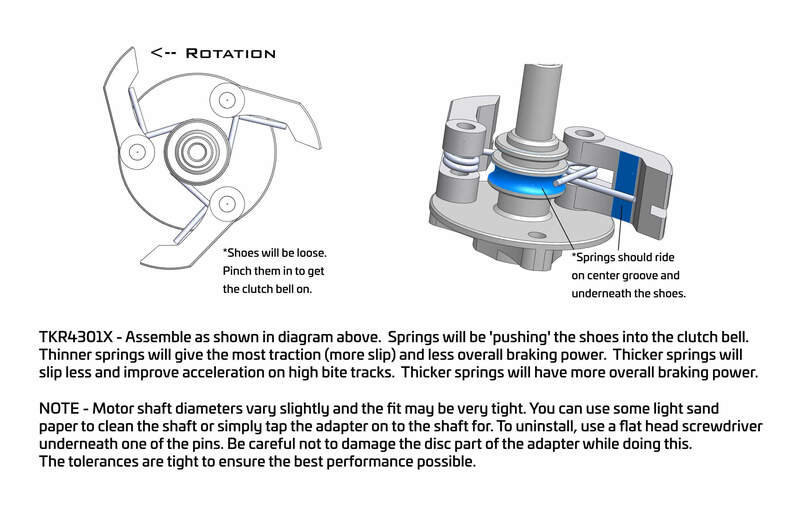 Traktion drive is not compatible with our standard NB/NT nitro clutch bells, nitro clutch shoes or nitro springs. Use the links below to select the clutch bells intended to be used with this system.